With the Hills on the boil owing to the agitation for Gorkhaland, the government has come up with a face-saver. 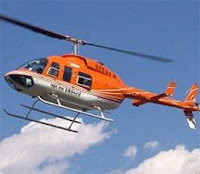 It is planning to introduce a joyride on helicopter over Dooars and Darjeeling during Puja instead of starting chopper services between Badogra and Darjeeling.“The way the situation in Darjeeling is escalating tourists might not show an interest to visit the hills this puja. Under such circumstances, we have the option of introducing a joyride from Bagdogra that would provide tourists with an aerial view of Dooars and the hills. We will be forwarding our proposal to Pawan Hans soon,” said tourism minister Krishnendu Narayan Choudhuri. According to the earlier plans, the state tourism department was trying to convince Pawan Hans officials to introduce chopper services between Bagdogra-Darjeeling before the pujas. The plan is a brainchild of Choudhury who got the green light from chief minister Mamata Banerjee at a meeting of tourism stakeholders at the Writers’ Buildings in November 2012. “A helicopter service is a must for destinations which face perennial problems of landslides. But what do we do if the leaders of the Gorkha Janmukti Morcha carry out an agitation over a vague issue (Gorkhaland)?” said Choudhury. The chopper service would have taken off from Bagdogra and landed at the helipad at Lebong racecourse, around 9 km from Darjeeling town. Then, from Lebong the tourists or visitors would have to travel another 15 minutes by road to reach Darjeeling town. Presently, it takes around three to three-and a-half-hours to reach Darjeeling from Bagdogra by road. The toy train takes around 10 hours from Siliguri though services have stopped. Under the alternate plan, the helicopter ride, if it starts, would now cover Dooars and Darjeeling and would be for a duration of 45 minutes. Recently, Pawan Hans started a similar 20-minute joyride service over Kolkata. Hoteliers in Darjeeling, however, are still in doubt over how popular this service would be. They pointed out that people go to Darjeeling and the Dooars to spend a few days there. If a joyride starts from either of these two places, then it could have been popular as a part of the package. They claimed that it would be almost impossible to promote this service because it would originate from Bagdogra airport. “The best option is to bring back peace to the hills. We have recently sent a letter to the GJM leaders asking them to withdraw their agitation at least from the second week of September to October end considering the Puja rush,” said Asit Biswas, the secretary of Association for Conservation and Tourism - an NGO that promotes conservation tourism in the hills.